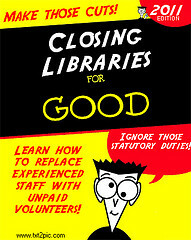 490 libraries (416 buildings and 74 mobiles) currently under threat or closed/left council control since 1/4/11 out of c.4517 in the UK. For full breakdown by authority, see “tally” on right. News = (S) notes information added on Sunday. Advocacy: public library as amenity and necessity – Lorcan Dempsey’s weblog. Analysis and thoughts on “It is the fate of libraries to die” article in the Financial Times. Blackwell’s chief executive redundant and warning more jobs may go – Oxford Mail. “…the library supply business had been hit by nationwide library closures and changes in council book-buying habits, likely to be done through larger consortiums in future”. “It takes/ Less than a lifetime to renew the ignorance/ This public mind was built here to dispel.” Sean O’Brien, “On the Toon”, Independent. Books vs. Ebooks – NewsWeek. Excellent infographic showing the current state of play – only 15% of ebook owners say they will stop reading print books. “Walking to the library is still the most ecofriendly way to read”. Days of reckoning – Financial Times. Surveys the cuts taking place, with cuts in libraries featuring. Library cuts and closures: a roundup – Peter’s BookSelling Services. London Word Festival Review: Intergender wrestling/The Goodbye Library – Londonist. Political purge of UK Facebook under way – OurKingdom. Following on from Google’s proposed deletion of video archives, Facebook delete political groups without warning. Privatized library foes lose their battle in court – AE Monthly (S). Santa Clarita (California) to be run by LSSI after campaigners lose court case over loss of privacy. Council hired five high school students to be library trustees so as to meet technical requirements. 10000 petition ignored. One further legal case still ongoing but this will only take place after library is privatised. Fears over staffing/wages/pernsions. State moves to make similar privatisations only allowable after public vote. Save our libraries ribbons – Voices for the Library. Purchase “save our libraries” ribbons (as worn by Melvyn Bragg, Philip Pullman et al at Oxford Literary Festival) for your campaign. Storytime at NatWest – Library Workers for a Brighter Future/UK Uncut (Video). “Great fun today. Natwest staff very obliging – guess they all know we truly are in this together.” says organiser. More details at False Economy. Nottingham – 25% cut in bookfund. “Mike Phipps, chairman of Kensal Green ward Labour group, said the controversial closures were the ‘most toxic political issue for the party since the Iraq war. He said: “There is real anger about these closures. It is not what people joined the party for and it is not what people in the party campaigned for party candidates for. “Closing libraries is a panic decision. These weren’t the cuts which needed to be made and I think they have alienated Labour’s own volunteers and members as well as Brent voters generally.” Brent – Brent Labour Party at war over toxic library cuts – Willesden and Brent Times. Durham – Plan to axe Sunday opening of Durham Library – BBC (S) Durham aiming to end Sunday opening at its only library to do so due to lower usage on that day. Falkirk – Falkirk leisure trust moves step nearer – Falkirk Herald. Charitable trust to take over leisure, culture and libraries. Gloucestershire – Have your say on the library service in Hester’s Way – This is Gloucestershire. Community group to have meeting with residents on proposed takeover of threatened library. Lambeth – The future of libraries in Lambeth (S) – Tradescant Road. To bring libraries up to safety standards would cost £1.5m. Commission on future of service to meet on 11th May. branch and have a storytime there (S). Suffolk – Library Consultation ends with “Andrew Lansley” moment as Mark Bee receives Bungay Library scrapbook– James Hargrave’s Blog (S). New council leader receives scrapbook showing demonstrations supporting the library, promises review of council position. Could be another consultation. Conservatives notably on defensive over proposed closures, increased campaiging before election. Somerset – Statement from Terry Clay on behalf of Friends of Somerset Libraries on SCC proposals to cut hours of libraries – Streetzuup (S). Swindon – Popular librarian retures after 47 years – Swindon Advertiser. Library user since the age of three, library worker since 1963, local icon steps down. Swindon – Letter from Shirley Burnham – Swindon Advertiser. Swindon’s libraries face an uncertain future with consultants looking at “alternative delivery options”. Print article This entry was posted by Ian Anstice on April 30, 2011 at 9:19 pm, and is filed under Uncategorized. Follow any responses to this post through RSS 2.0. You can skip to the end and leave a response. Pinging is currently not allowed.